Usually mundane talk about weather has gotten more interesting this summer all across America, as sweltering temperatures, monsoon-like downpours, floods, droughts, and tornado outbreaks have become the new normal. I am not here to make a statement on global warming, but even Minnesota has gotten downright tropical–not just hot, but incredibly humid. As a result, all sorts of strange things have been happening. My wife’s tomato plants look like shrubs. Outside air condenses on the cool windows of our homes and cars. Rain, thunder, and lightning seem to come and go daily, as in the rainforest. Icy roads of winter are replaced by slippery, moss-covered roads of summer. Tree canopies are beginning to cover entire neighborhoods. Joggers are tripping over sprawling green vines that grow by the hour. 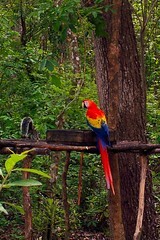 Beautiful macaws and toucans have replaced the usual robins, blue jays, and cardinals. Reports of traditional roadkill like deer and skunks have been replaced by stories of squashed 20-foot boa constrictors and tree sloths. Then there are the monkeys raiding vegetable gardens and the gorillas squatting in abandoned homes and scaring away house hunters. And WHY does our new weather man wear a loin cloth, let out wild calls, and swing from vines?